Today, in an admirably bold move, Jon Hicks ripped the dust covers off his skeletons and revealed his sordid past. I commend Jon’s bravery, his honesty, his willingness to subject himself to the ridicule of the standardistas. I mean, seriously Jon, Tripod!? Tsk tsk. Everybody knows real designers use GeoCities. But, not wishing to leave Jon to suffer alone, I’ll dig up some of my own embarassing fossils. I discovered the internet in October of 1995 in a computer lab at Pittsburg State University. My friend Majed showed me how to get on IRC through a telnet session to my university shell account. I was hooked. One of the people I met on IRC (Erica, who was then attending UIUC) had some web space on her university tilde account and had set up a little site of her own. I sent her about two pages of inane self-indulgent copy and she put it online in its own directory, and that was, in essence, my very first website. It was just white text on a black background, no formatting, no links, and is thankfully long lost within the anals of time (that’s not a typo). But I had caught the bug. 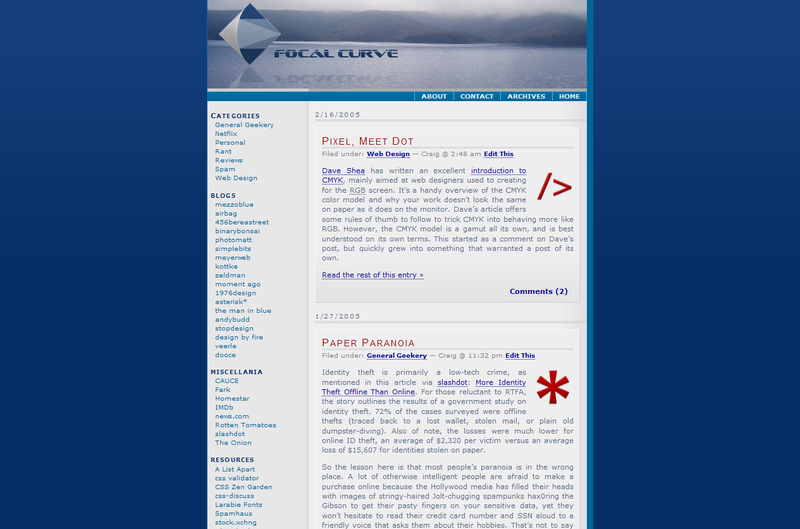 I started tinkering with some basic HTML 2.0 and assembled my first real web page in the spring of 1996 using some freeware WYSIWYG app I downloaded, whose name I can’t recall. The page consisted of a header image lifted from an H.R. Giger painting, a single column of centered text, and a few links to the sites of my IRC friends. I proudly slapped it online at a trendy GeoCities address, which remained active up until about a year ago simply through association with my old Yahoo email account. 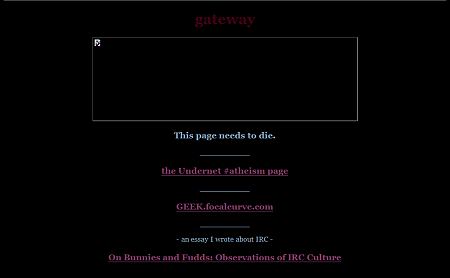 Alas, that first site is now long deceased, may it rest in peace. Some time later I redesigned it even darker and angstier, and when I finally got my own hosted domain in 2002 I euthanized the old GeoCities site for good. I managed to exhume a partial corpse of the placeholder I left behind from Google’s cache. Attempting to visit the original URL results in a Yahoo error page. Farewell, old crappy page of pretentious gothy lameness. In the fall semester of 1996 I, erm, “aquired” a copy of Adobe PageMill 2 and I discovered tables and frames. Ohhh how I loved frames… They became my primary layout weapon of choice as I began my professional career. I did some fairly complex frame-based designs that I’m still fairly proud of just for the technical achievement. Some of them even look pretty nice. 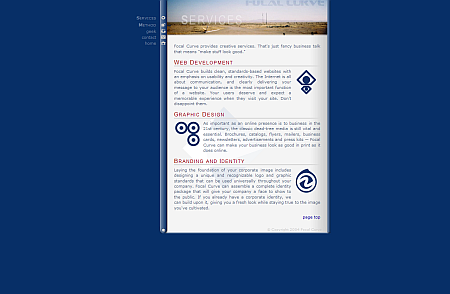 When a colleague and I decided to form Focal Curve as a freelance web design company, a site of our own was a foregone conclusion. And of course it was going to involve frames. 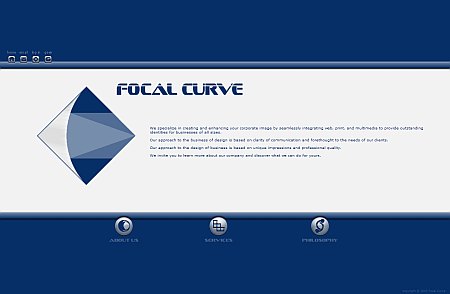 So around March of 2002 Focal Curve v1.0 was born in a blaze of framed chrome glory. A few months later came the first incarnation of the Geek subdomain, originally intended as a community portal running on PHP-Nuke. But the community never communed and it evolved (or degenerated, depending on how you look at it) into my personal journal. 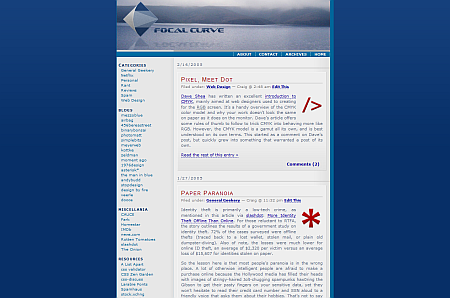 By December of 2003 I had deeply embrace web standards, so it was time for an overhaul. 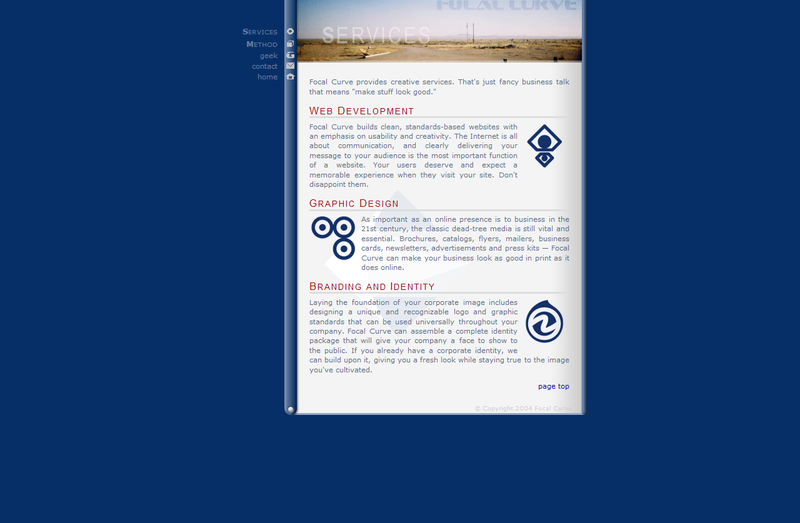 First I redesigned and rebuilt the company site. Then a few months later, in April 2004, I killed the Nuke portal and converted to WordPress 1.1 with a completely new design. 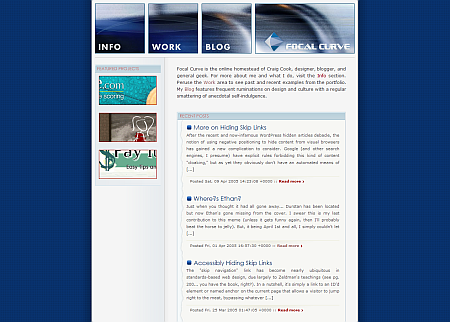 A year later, in January 2005, I resolved to rebuild both sites, finally merging them into one, and to have it finished before I went to SXSW. And this is where we are now. 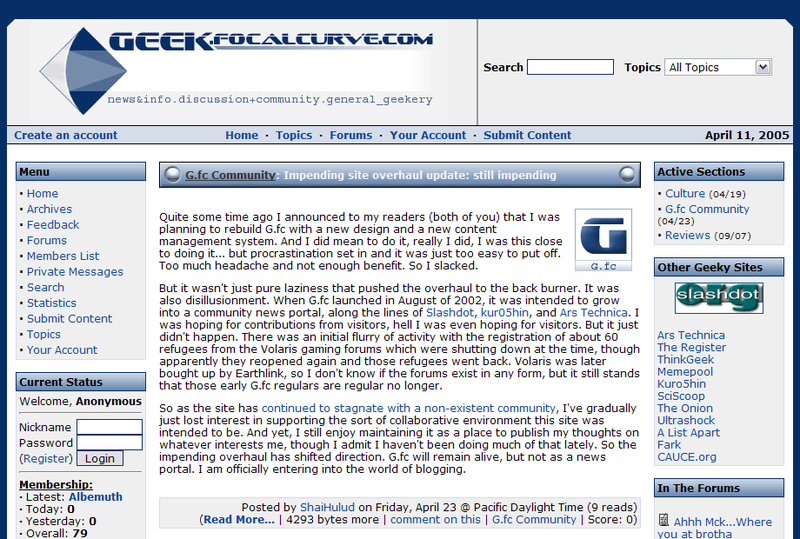 This was posted on Monday, April 11th, 2005 at 8:00 pm	and is filed under Design, Personal. Comments closed, no pings allowed.